Without belaboring how it got there, the author has developed a detailed and convincing post-apocalyptic world. Modern as far as the vehicles, weapons and computer technology are concerned, other elements have a medieval flavor including a feudal social structure and a bit of sword play. In this case the holdings of the elite are not so much land itself but what all need to survive--water. In other words, a few have gained control of the water supply with the different "houses" within "The Collective" system jockeying for positions within their own hierarchy while keeping the unfortunate masses at bay. The complexity of the political structure is well thought out and demonstrates a keen understanding of human nature as a relative handful of individuals struggle to maintain what they've acquired while also trying to advance through whatever means necessary. Victor Xonox is the primary villain among many. He's cruel and ruthless regarding everything and everyone save his beloved daughter, Pheona. He maintains his position with the proverbial iron fist enforced with lethal consequences. No one is allowed to obtain water except through his distribution channels. Anyone found having their own source such as a well is quickly dispatched. And thus we meet Abel, son of a former Army Ranger, whose family has their own covert water supply. Discovery results in the usual punishment except Abel escapes, bent on vengeance. As you would expect, Abel's quest results in his meeting up with a variety of interesting characters. Each is well-developed with a detailed background and agenda of their own which brings them vividly to life. While some action-oriented stories lack detail, that is not the case here. I measure fiction through a system I call IDEAS, an acronym which stands for Imagery, Dialog, Emotion, Action and Suspense. As a whole, a good story has an appropriate balance of them all. In this regard Hillard did an outstanding job. Visual, societal, weapons and character detail were outstanding, dialog convincing, enough emotion to make the characters human and provide motivation as well as plenty of action and suspense. At times I felt as if there were too many named characters and I had trouble keeping track of them all with their exotic names. However, life itself is populated with legions and given the plot and situations, having so many people around contributed to the story's convincing tone. So convincing, in fact, that its dark and gloomy essence was hard to bear at times since I'm not usually a fan of apocalyptic and dystopian tales, especially ones as vividly portrayed as this one. Clearly a commodity needed for life itself can be a powerful tool and those who seek position and control for selfish reasons will never hesitate to exploit situations that advance their personal agendas without regard for the good of anyone or anything else that stands in their way. Unfortunately, we see this every day. Thus, the premise itself of "The Collective" is highly credible given that there will always be despots like Victor Xonox who build an empire on the backs of those less fortunate. 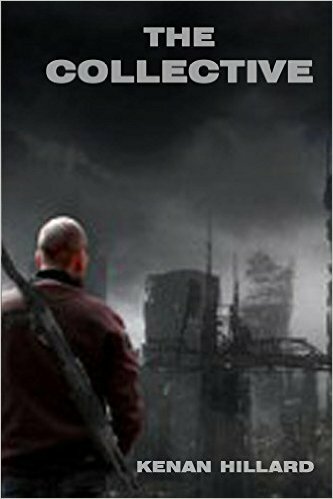 "The Collective" exposes and investigates the character of those with no regard for the lives of their fellow human beings. It inspires hope in that a leader or coalition of those opposing their evil intent will eventually also arise in the form of heroes and a few antiheroes. While this story had a reasonably satisfying ending, the author also left it open for a sequel which is sure to come. Whether or not you're a fan of dystopian tales this one is exceptionally well-written and worth reading as a reminder of what can happen when a few power-hungry individuals assume control of an essential commodity. Marcha Fox is an avid science fiction fan and author with over 20 years experience at NASA's Johnson Space Center in Houston, Texas. You can find her at StarTrailsSaga.